Content is not a fixed resource. This means in the age of the Facebook “News Feed” overload, marketers and businesses can implement different strategies to make their content stand out and capture the attention of Facebook users. Actually, it’s becoming a necessity to be different. Your Facebook audience, while procrastinating their commitments ahead of them, will take out a few minutes to scroll through their News Feed. Most likely, they’ll skip anything uninteresting. How can your content break through the noise? Visual storytelling has been a powerful state-of-the-heart method of communication that strikes the right emotional balance with children and adults alike. 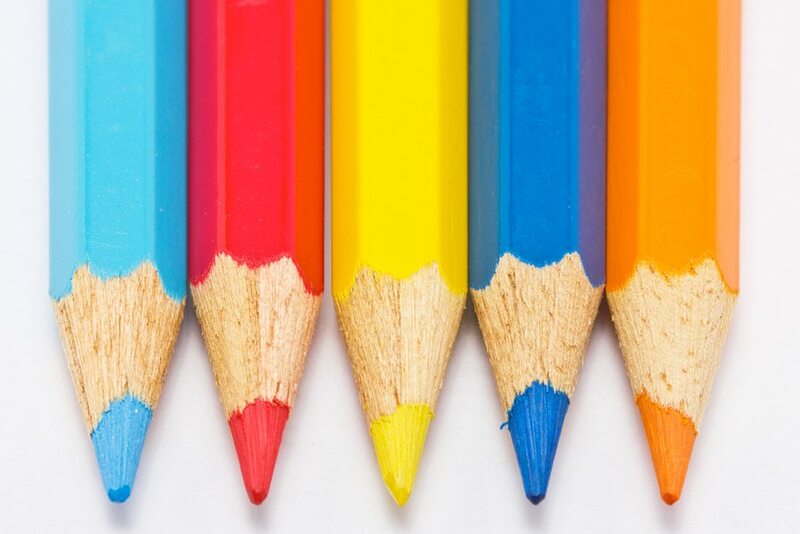 Instead of relying on a block of text, visual storytelling follows ‘show, don’t tell’ approach which results in greater engagement, traffic, and sales. As a result, integrating story-depicting visuals into the content you post on Facebook will increase consumer interactions, even if your target audience are short on time. An effective way to connect with your fans is to post images that give a peek into the inner culture and values of your firm. It is important to gain the trust of your customers, so showing them who you are as a company will create a more personal interaction and give customers a reason to want to choose you over competitors. 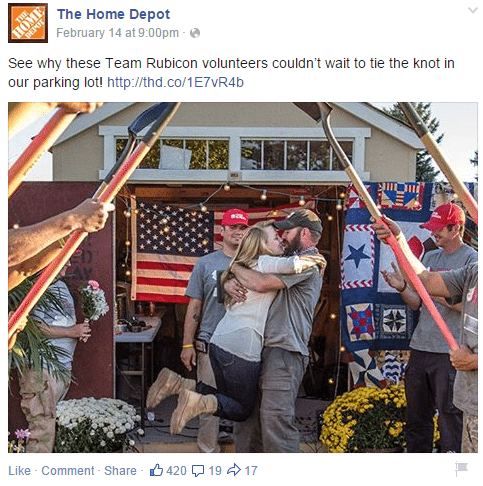 The Home Depot shared this image on its Facebook page showcasing their social responsibility and support for the vets. Mascots can do wonders on Facebook. They will give a face and a personality to your brand, and be the figure that customers can relate to than a bunch of brand logos. Also, a mascot is nearly always the option if your brand’s target audience includes children. Apart from encouraging the audience to engage, the right mascot can push your brand beyond social. According to a study, fictional characters are even more effective at creating a social media buzz than celebrities. 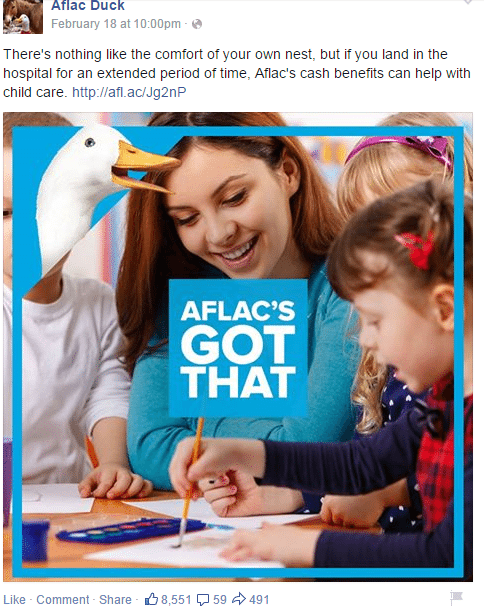 Aflac Duck successfully transitioned from television to social media, and has gained over 600,000 fans. Let your audience tell your brand’s story by encouraging them to submit content. Posting fan-generated content on Facebook will not only allow you show appreciation, it will lead to a deeper connection between the company and its customers. Show your fans you appreciate their engagement by sharing their submissions and tagging them. Your customers will be happy to see your brand reciprocating their input, which should get them talking. The word-of-mouth promotion resonates well with other people. 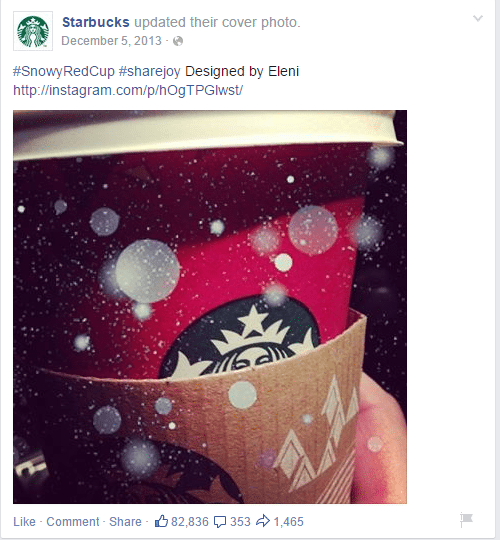 When the brand shared a photo of a Starbucks cup designed by a customer, it generated a massive response from the Starbucks’ Facebook community with over 80,000 likes, 1,400 shares and 350 comments. Share reviews and testimonials from those benefitting from your brand, and share with your audience the impact your brand has had on the lives of people around the world. This will make them more inclined to be involved with you in the future. Positive nostalgia sparks true emotions. Showing how you started, the difficulties you have overcome and how you’ve changed lives with your product or service will make your audience proud to be related to you and all the effort you’ve made over the years. 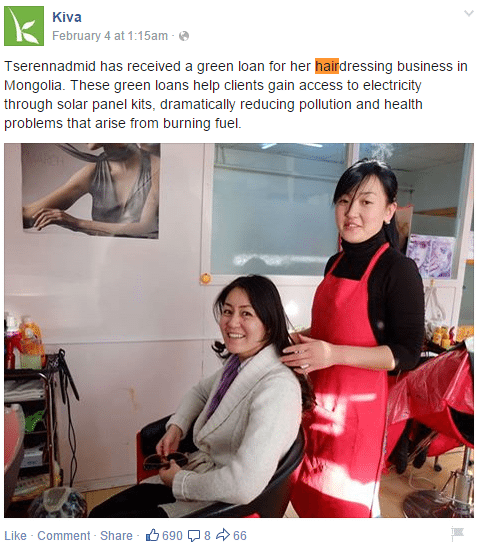 This post highlights how an individual received Kiva’s green loan to start a hairdressing venture in Mongolia. Not only the green loan helped her start a business, but also reduce her carbon footprint by helping her gain electricity through solar panel kits, reducing health problems and pollution in return. Videos can be used for impactful storytelling in a way that even images can’t match. 8/10 most shared content on Facebook last year included some form of video. 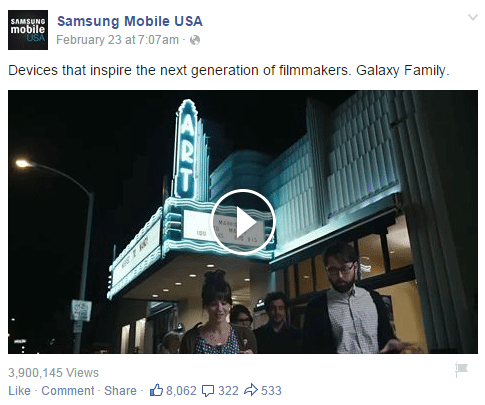 Translating stories into videos can even seem like mini-blockbuster movies that people love to share and comment upon. The action on the screen shows audience exactly how they will benefit, which will likely inspire, motivate, and excite your audience. Most of their video posts receive a lot of engagement. Understanding how you use visuals to portray your brand’s story will add a new dimension to your marketing mix. 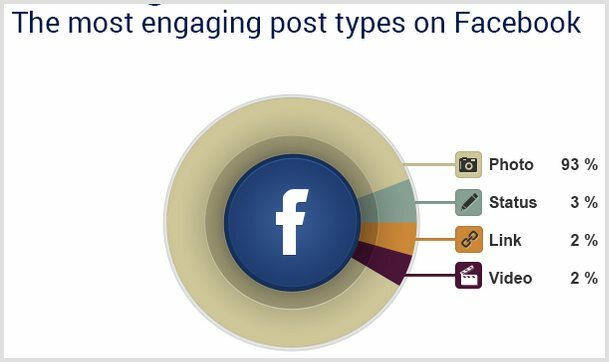 With these tips at your disposal, you’ll be able to connect more deeply with your audience and drive more traffic to your Facebook page.